Catherine Velez, who is a Stop & Shop Peapod employee, joined her coworkers in East Hartford as they went on strike against the company Thurs., April 11. 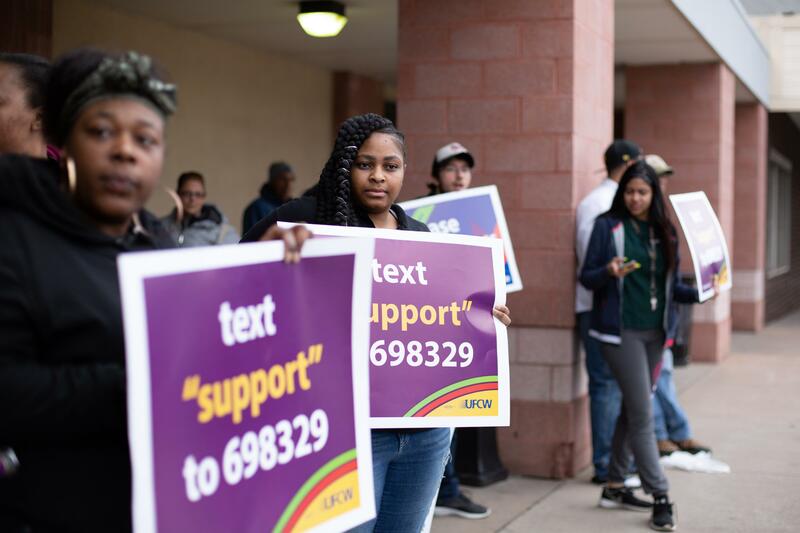 Workers clustered together at the two entrances to the Stop & Shop store in East Hartford, holding signs in the air and chanting, "Better contract, better lives. Better contract, better lives!" "I believe they (Stop & Shop) are not trying their best to work out an agreement," said Vanessa White, an employee of the East Hartford store for 16 years. The Massachusetts-based company, which is owned by a Dutch parent Ahold Delhaize, this week profferred what it said was a final offer in the talks. White said her job helps support her two children, and for the most part, she's liked working for the company—until now. 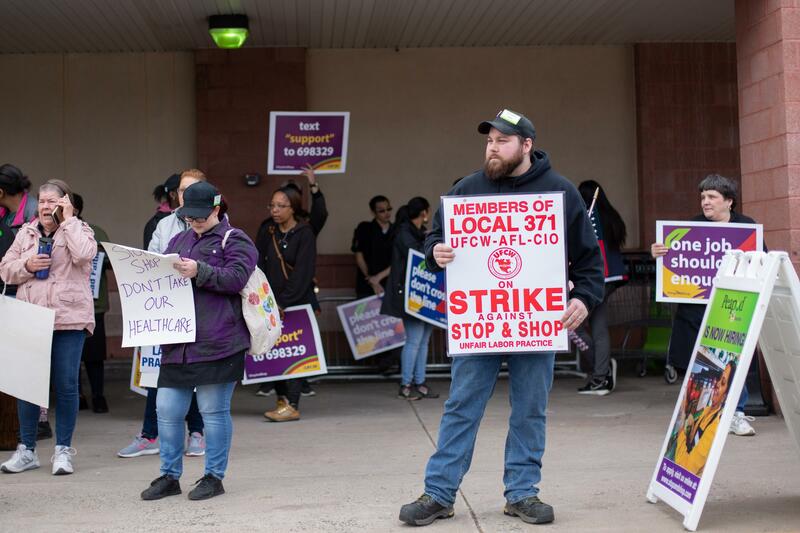 Stop & Shop unionized workers in East Hartford go on strike Thurs., April 11, as the parent company continues contract negotiations with unions for employee benefits. The five union locals involved in the strike action issued a statement, saying, "instead of a contract that recognizes the value and hard work that our members provide every day, Stop & Shop has only proposed drastic and unreasonable cuts to health care benefits and take home pay, while replacing real customer service with more serve-yourself checkout machines." Steven Blank works in the meat department at the Stop & Shop in East Hartford. He joined co-workers as the walked out Thurs., April 11, in a strike against their employer. Workers at local Stop and Shop grocery stores could soon go on strike. That would impact 91 stores in Connecticut – all of them employ members of the United Food and Commercial Workers union. Should Connecticut Join The List Of States Raising The Minimum Wage? Progressive lawmakers around the country have been rallying behind a call for a $15 minimum wage, and Connecticut Governor Ned Lamont has joined their ranks. This hour, what would increasing the minimum wage by almost 150 percent over the next four years mean for businesses and workers here in Connecticut? We hear from an economist and get the takes of several local business owners on Democrats’ proposal to increase the minimum wage to $15 per hour by 2023.